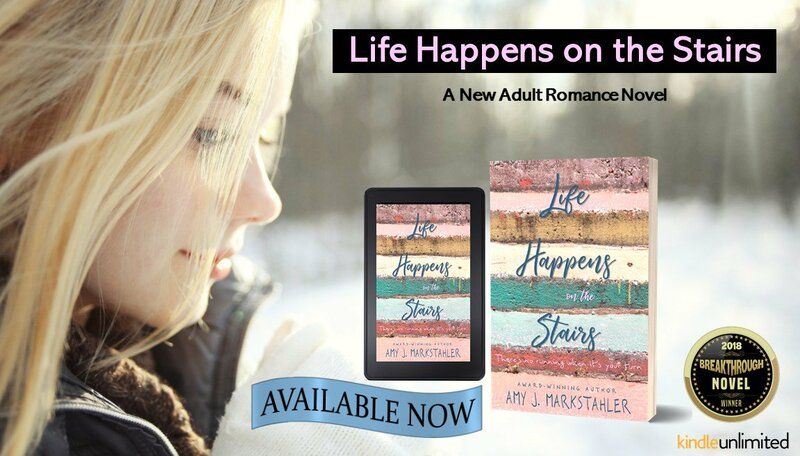 I am so excited to announce my debut novel Life Happens on the Stairs is available now! It has been a fantastic weekend, so much so, I forgot to write about it on my website! Better late than never, though. September 1st was an absolute blast as I spent the day online celebrating the release. I had many friends and family right there with me, some were even reading all day long, sending me updates and love for the story. I can't thank you all enough for making the day special! The debut went from a Hot New Release on Amazon to a #1 New Release in YA genres. It's on sale for a limited time for .99 cents and is also available on Kindle Unlimited. I'm receiving wonderful feedback from readers. Reviews like this are popping up on Amazon already! I read a lot! Having said that this is not my “typical” genre. However having said that I really really enjoyed this book. I read it in record time and it is as well written as any other and better than most. The story with its ups and downs is better than I expected. Take note young men Tyler Vaughn exhibits how you are supposed to act towards a young woman. Get to writing Mrs. Marstahler, you are obviously as talented a writer as Elsie is an artist. The reading world deserves more of your stories. 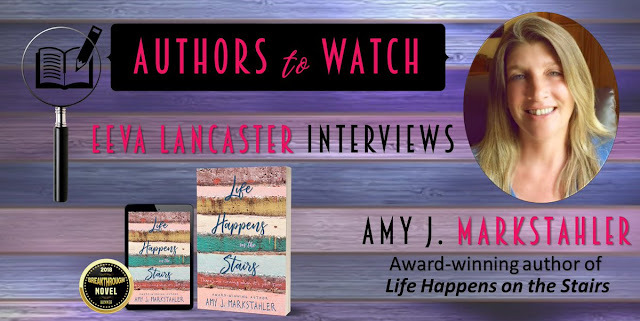 “Life Happens on the Stairs” is the story of a young woman as she overcomes life’s struggles leading to adulthood. That’s the simple description of a story that is MUCH more. It isn’t often that I find myself so immersed in a book that it makes me cry, but “Life Happens...” is one such book. 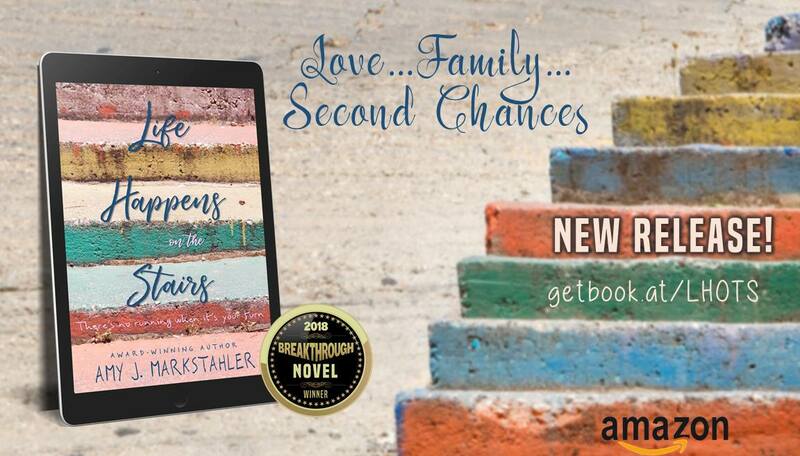 Ms. Markstahler puts the reader “into” the story in such a natural way that you feel the life of the protagonist, Elsie Richardson -- her ups and downs. It’s funny, sweet, sad, and heartfelt. I absolutely loved it! This is, hands down, the best novel I’ve read in ages. If I could give it ten stars, I would. One of the things I really love is when I come across an exciting new author, from time to time. Amy Markstahler definitely fits into that category. Her debut novel, Life Happens on the Stairs is romance the way it should be. Plenty of drama, plenty of angst and plenty of conflict, but with wonderful underlying values. Think of "Upstairs Downstairs" or "Downton Abbey" in 2018 and you have this wonderful story of the working class girl who falls for the grandson of the woman whose luxury southern mansion, she cleans for, to help out her mother. A wonderful story - great characters and a nail-biting will they/won't they relationship. I loved this. Life Happens On The Stairs had me engrossed from page one to the end. First book in years I have read in one day while I was transfixed into the story.... Laughing, crying, saying noooo don't run.....what a great read and I am sorry It's over! Ready for book 2! .....and the movie version! Thank you everyone for your wonderful words and reviews! I couldn't be more thrilled to have my debut novel be received with such praise! Elsie Richardson’s world crumbled when her dad dropped with a seizure at the 4th of July festival. The reality that his brain tumor is back with a vengeance slams the 17-year-old aspiring artist and her family into intense hardship. Her mom needs help to make ends meet, forcing Elsie into adulting overnight. On top of that, Elsie’s caustic, grudge-holding brother is on his way home, and Elsie fears he will only make matters worse. Over the next few weeks, Tyler becomes her secret solace amidst all the uncertainty she’s facing. But when reality strikes and her private world crashes, she's forced to find her inner strength on her own. I would also like to invite you to the Authors to Watch page and check out my interview with Eeva Lancaster. You can read what inspired me to write LHOTS plus a few more things, too! The paperback will be coming soon to order on an Amazon app near you! Hope everyone enjoys, or more so, falls in love with Life Happens on the Stairs! Hello Amy, congratulations on your debut novel. I see it won the Breakthrough Novel Awards, I was wondering if you found this contest helpful and if you'd recommend debut authors like myself to enter? Good luck with LHOTS, I look forward to reading it. Thank you very much! Yes, I highly recommend the BNA contest!! It has made the world of difference for my novel and writing career! Best wishes!